Wilhelm Eitel Friedrich Christian Karl von Hohenzollern (born in Potsdam, Germany, on July, 7 1883) is a Prince of the House of Hohenzollern. The second son of Kaiser Wilhelm II, he was victim of a financial scandal in 1926 that quite tarnished the prestige of the House of Hohenzollern. Born in Potsdam to the future Kaiser Wilhelm II and future Empress Augusta Viktoria of Schleswig-Holstein, Prince Eitel Friedrich was educated, along with his brothers, in the Plön Prinzenhaus, and married in 1906 to the Duchess Sophie Charlotte of Oldenburg, and was named in 1907 Grand Master of the Lutheran Order of Saint John. Assuming during the Weltkrieg the commandment of the 1st Garde-Regiments zu Fuß, he was noticed from his exemplary courage. He temporarily relinquished command to Count Hans von Blumenthal, but returned to duty before the end of the year. 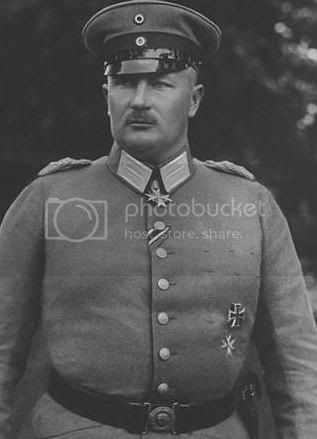 The following year he was transferred to the Eastern Front and during the Summer of 1915, was out in a field in Russia when he had a chance encounter with Manfred von Richthofen who had just crashed with his superior officer, Count Holck, and was believing that the advancing troops were Russian ones: it was in fact Prince Eitel's. After the Weltkrieg, he begun to officially support Pan-Germanist and nationalist groups in Eastern Europe and to support a preventive attack against the Commune of France. Prince Eitel Friedrich's political career was quickly broken when a socialist newspaper, on June 1926, revealed that the Prince had made during the last years of the Weltkrieg various embezllement of funds coming from the food supplying of the blockade, along with various officials, both agrarian and military, of the Hindenburg-Ludendorff dictatorship. In these times, Germany was still suffering from war restrictions and poverty and it caused great emotion throughout the country. The Imperial family and the government refused to support the Prince, while Social-Democrat, Marxist and Republican politicians were beginning to make the trial of the monarchy. In September 1926, after three months of silence and the beginning of a trial, Prince Eitel Friedrich announced that all charges against him had been withdrew, causing a great outrage due to the effective position of the Hohenzollerns above the laws. However, he resigned from his post of Grand Master (succeeded by his brother, the Prince Oskar and stopped his support to the colonization in the United Baltic Duchy. The following month, his divorce definitely broke him morally. The scandal created a lot of political debate in Germany, along with the tentative of suicide of Prince Joachim and the affair of Prince Wilhelm. However, he continues to carry his official positions within the Imperial Army. Prince Eitel Friedrich was married from February, 27 1906 to October, 20 1926 to Duchess Sophie Charlotte Holstein-Gottorp von Oldenburg, born on February, 2 1879. They divorced following the financial scandal and had no children. This page was last modified on 1 July 2009, at 20:24.